Come check out Troop 281 - we typically meet the first 3 Tuesdays of the month at Gold River Discovery Center, 7:00-8:30 pm during the school year. Contact us to confirm t he location and meeting as they sometimes change. Cub Scouts, Webelos, boys interested in Boy Scouts and their families are invited. Contact Teri Peterson: terson62@gmail.com or 916-204-9053 for more information. Troop 281 will hold a merit badge day on 4/27/2019. The Troop is offering 3 merit badges: Citizenship in the Community (Mr Van Horssen, Merit Badge Counselor); Communications (Mr Block, Merit Badge Counselor) and Electronics (Mr Scheffelin, Merit Badge Counselor). Citizenship in the Community and Communications are both Eagle required merit badges. Advanced work on requirements is needed to complete the merit badges on 4/27 (or, of course, you can complete the requirements after 4/27/2019). The list of advanced work will be emailed to participants approximately 1-week before merit badge day. Scouts and Parents — This weekend, three scouts participated in Introduction to Leadership Skills for Troops (ILST). This training helped the scouts to learn leadership skills and learn how to be successful in their troop leadership positions. There is no Troop 281 meeting this week, because the Gold River Discovery Center is closed this week. On 4/27/2019, the troop will hold a Merit Badge Saturday event. Sign up on the troop website. Remember to let the Scout Oath and Law be your guide. Be a Merit Badge Counselor! 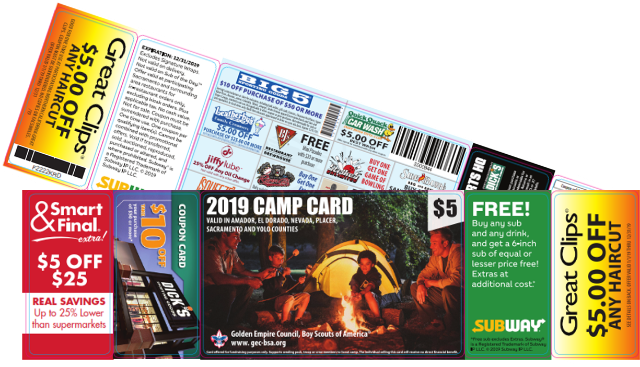 The Camp Card fundraiser is designed to help Scouts earn their way to summer camp, high adventure or fund other scouting adventures. Scouts who participate in this fundraiser will earn 50% commission ($2.50) for each $5 Camp Card they sell. The sale begins in March and ends May 14, 2019. On February 1, 2019, Scouts BSA was launched. Scouts BSA is a year-round program for youth in fifth grade through high school that provides fun, adventure, learning, challenge, and responsibility to help them become the best version of themselves. In Scouts BSA, young men and women go places, test themselves, and have one-of-a-kind adventures that can’t be found anywhere else. For the first time in its 100+ year history, the iconic program of the Boy Scouts of America is open to young women as well as young men, all of whom will have the chance to earn Scouting’s highest rank, Eagle Scout. Click here to learn more.